Old house completely renovated with all comfort for 6 persons. In a big wooded property, in a very quiet valley with a small river/waterfall. Just take a look at the stars and enjoy the silence. Large sunny terrace with panoramic view of the forest and the mountains or you can also make a barbecue with your friends in this spacious and covered terrace facing the river. You can also make a good fire in the fireplace if needed. The house offers several areas for reading and writing with a very nice decoration. The modern kitchen gives access to the covered terrace. Village and waterfall for swimming just 5 km away. Ganges is located 15 min away, where you will find the most animated market of the region. The Parc des Cevennes with its spectacular hikes is available for you! This is the perfect place to escape from everything! I was born in Lyon but I spent my childhood in Normandy by the seaside. Then our large family moved South to Marseille; this gave me a taste for sunny Riviera. After finishing an engineer degree in Pris I settle in California, more than 40 years ago! We started a family with 2 children. Yet we did not forget sweet living in France where my five brothers and sisters live. So we bought this house in 2002 for my retirement. The bathroom measures 10 sqm and has an independent water-closet including an spacious oval bathtub with shower. A fanlight provides a very homely light. There is an alcove sheltered with bed linens and numerous towels. Hot lighting on tiled walls and natural wood. An additional and very original bathroom for the summer downstairs, in a room vaulted in the rock with shower and WC. The kitchen includes a butane gas cooker with 6 hobs, an electronic oven, a dishwasher and a refrigerator + an espresso coffee maker, a toaster and many storage areas. There is also cutlery for 12 persons and a table for 6. A covered terrace with a table for 10 and a stone BBQ. In the living room is a hi-fi stereo system and a TV to watch all DVD's. Washing-machine and tumble-dryer are downstairs. Bed linen and towels are provided. Mosquito net available above the beds. Fuel central heating for the cold season. Telephone and low speed internet are in the same bandwidth. Unlimited Internet but for phone calls, you must buy a phone card at the tobacconist's. Several games and books are available. This house is located 4 km away from Saint-Laurent-le-Minier along a joyful stream. The waterfall of The Vis, located 4 km away, allows you to swim in pure water. There is a municipal tennis court located 4 km away. The spectacular Cirque de Navacelles is located 15 km away in a wild valley. Ganges with its market, the most animated of the region, is located 10 min away. 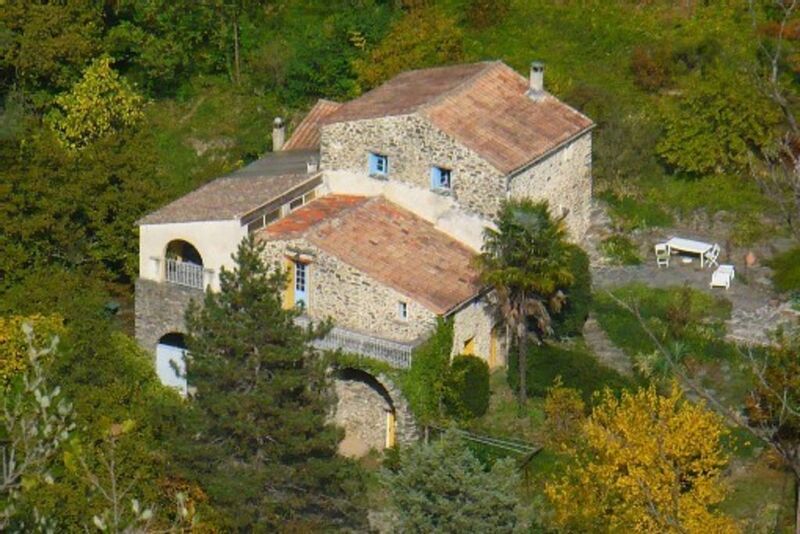 Located on the southern edge of the magnificent Cevennes National Park with its many hikes. It is also close to the many medieval villages with summer festivals. An hour away by car you can also find the Grotte des Demoiselles and the Mont Aigoual. Pretty sandy beaches 65 km away. Access to Montpellier and Nîmes is 50 km away with TGV and airports.